Alzheimer’s disease affects women in different and often worse ways than men. In a society where women are often considered dispensable wombs, the commitment required for sustained care of a woman who is affected, without any hope of recovery, is often absent. Alzheimer’s is a progressive, unforgiving, and relentless disease that has no possibility of a recovery, or cure, as yet. It not only destroys the life of the affected person, but also of those close to them. It is a complex set of symptoms that are unpredictable in their appearance, which include confusion, loss of memory, loss of cognitive functions, severe agitation and anxiety often close to paranoia, personality changes, impaired judgement, inappropriate behaviour that can often be baffling, a progressive inability to do even familiar tasks, a lack of normal orientation of time and place, loss of language ability, a loss of self-awareness, forgetting familiar names and faces, even those of family members, a disregard for grooming and self-care in any form, and a progressive loss of control over motor skills and bodily functions. The patient soon becomes completely bedridden, and is lost as a person. Women have always been second in the pecking order between the genders. They often do not get adequate nutrition and health care right from childhood, and that continues into adulthood. The very basic of rights are often denied to them, and they are often financially and socially dependent on men. So how does it pan out for women with Alzheimer’s? How does Alzheimer’s become gendered? Let us look at some statistics for Alzheimer’s. 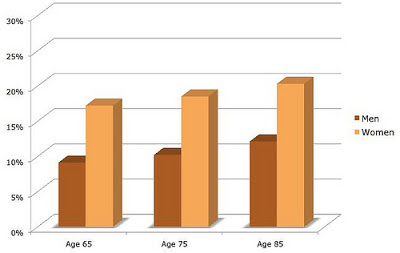 Alzheimer’s age and gender wise distribution. Image source here. Nearly 44 million people worldwide have been diagnosed as having Alzheimer’s. By 2050, as the population over 65 grows higher, the number is expected to go up to 115 million. Nearly two-third of those with Alzheimer’s disease are women. Because of a lack of awareness and the difficulty and high costs of diagnosis, Alzheimer’s is likely to be under-reported, especially in developing countries like India, and especially among women, and the actual numbers may be much higher than known. At age 65, women who are normal have more than a one in six chance of developing Alzheimer’s during the remainder of their lives, compared to a one in 11 chance for men. Among seniors above 70 years of age, 16 percent of women have Alzheimer’s and other dementias, compared to 11 percent of men. Risk – why is it higher for women? Women often outlive their men. Mortality is higher in men due to heart diseases, cancers and other illnesses due to lifestyle choices like alcohol and tobacco use (in any form), accidental deaths due to testosterone driven risky behaviour, etc. There is therefore a clear predominance of women for every year over 60. So the catchment population at risk of Alzheimer’s is skewed in favour of women. Oestrogen is a wonder hormone of women that protects them in many ways – well-known are the protective effect on the cardiovascular system (heart and blood vessels), the bones (protection against decalcification of bones), and the brain. The ways in which oestrogen specifically protects against Alzheimer’s are complex, and have to do with safeguarding nerve cells from amyloid deposits that cause the destruction characteristic of the disease and facilitating the chemicals called neurotransmitters, that transmit nerve impulses from one cell to the next. Post menopause, this protection dwindles, and leaves women vulnerable, and chances of Alzheimer’s increases for every year of life after 65. Women are also at a higher risk due to a few other causes. Three times as many women are known to suffer from stress because of psycho-social factors and frequent hormonal changes as men. Twice as many women are known to suffer from severe depression – whether reactive or endogenous – as men. Women are more likely to be Vitamin D deficient and malnourished. All of these have a significant effect on the genesis of Alzheimer’s. Women are also at a higher risk due to a few other causes. Three times as many women are known to suffer from stress because of psycho-social factors and frequent hormonal changes as men. Twice as many women are known to suffer from severe depression and Vitamin D deficiency.All of these have a significant effect on the genesis of Alzheimer’s. Early symptoms of Alzheimer’s cannot be easily distinguished from random forgetfulness or other dementias. By the time the symptoms become characteristic of Alzheimer’s, the disease has already advanced. Women are more dependent financially and socially. This means that the diagnostic tests for Alzheimer’s like MRI, CT scans, genetic testing, etc. may not be easily accessible. Men might just not feel that the expenses are justified on mere women. Women are also more likely to ignore early symptoms and approach a doctor only after things get out of hand. For all the reasons enumerated above, women are less likely to receive adequate treatment, either in terms of medical help, or as financial and emotional support. Take a look at the symptoms listed above again. Our society can be unforgiving of a woman who is unable to work and care for the family, do the tasks required for day-to-day functioning of a household, and exhibits behaviour that can be considered non-traditional or even bizarre. Caring for a patient takes a lot of toll on a caregiver – psychologically, financially, and physically. Most men are unable to, even incapable of giving sustained care to a spouse or a parent who suffers from the disease. Often, in Indian society, the caregiver might be the daughter-in-law, or rarely a daughter, a situation that can be fraught with many difficulties. We also do not yet have in place a system of professional caregiving like hospices or support for caregivers, something that is vital in the link for adequate care in Alzheimer’s. And then there is that little matter of social stigma attached to any disease that manifests with behavioural and personality disorders – a stigma that attaches itself more firmly to a woman who is affected, further reducing any support from a society that has poor appreciation of the facts. There is that little matter of social stigma attached to any disease that manifests with behavioural and personality disorders – a stigma that attaches itself more firmly to a woman who is affected, further reducing any support from a society that has poor appreciation of the facts. But until there is a mind-set change, prospects for women with Alzheimer’s look bleak. Thanks for the wonderful write up. Truly eye opening. Do write more.